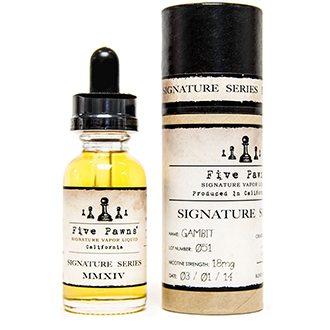 Gambit by Five Pawns is one of the top quality E juices created by Signature Vapour Liquid Producers in California USA. They have a collection of Signature E juices which are split into two categories. The Mixology edition which are alcohol based blends and the Signature series, which contains another 5 Handmade juices blending fruits and desserts. Every year Five Pawns will release one limited edition flavour per series. These juices have been aged and steeped for that unique untouched flavour. Gambit from the signature series is “The classic, mellow apple pie makes a sweet and savory impression with flaky crust and decadent caramel, lightened by a dollop of French vanilla ice cream and unsweetened whipped cream” as stated by Five Pawns. Gambit definitely offers that individual shopping experience, the first thing that’s attracts attention is packaging. Bottles are presented in individual tubular boxes with old authentic looking labels. Personally once the bottle is finished I will be keeping the box out for people to view!! The juice itself is thick and rich with a sweet smelling top note of cream. Gambit would definitely not be suitable for an e-go pen due to the thickness of the juice as it struggles with the wicking system. Placed in a dual core atomiser its vapes beautifully with a good cloudy exhale along with a rich a creamy taste. Initially the apple pie comes through with the rich caramel, followed by creamy top notes which gives a dessert vape I myself definitely desire. I would definitely say this would be great in a sub ohm tank with more watts, it would intensify the richness of the e juice demonstrating its full potential. It is more expensive compared to your usual juices but I can see why its obvious time, care and passion have all been used while creating Gambit. Gambit offers a multi layered yet expertly blended juice. For vapers looking for something a little more up market it’s a must!! This entry was posted in Reviews, Vapeology and tagged American, California, Chigwell, e juice, e liquid, Five Pawns, Gambit, Loughton, PG, Quality, Tank Puffin, USA, USA Premium E Juice, USA Premium E liquid, VG. Bookmark the permalink.